Hello friend! I hope you’ve been having a wonderful 2019 so far! If you know me, you know I absolutely love snacks and treats, even if they don’t always love me back. 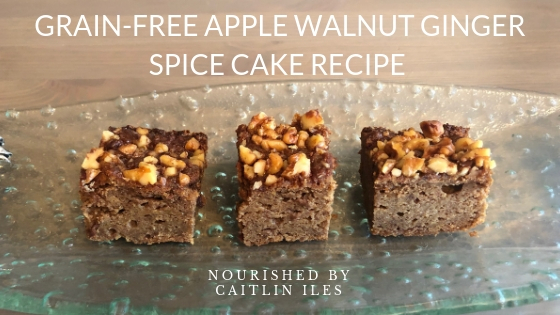 And so this week I thought I would share a recipe for a delicious, grain-free, protein-packed Apple Walnut Ginger Spice Cake! This little baby did not last very long in my kitchen… and since I live alone we all know what that means. I did share one slice with a friend to test out whether it was actually tasty or if I was just treat deprived and she gave it two solid thumbs up, so I think we’re in business! I tend to avoid grains as much as possible due to the potential inflammatory effects on the digestive tract and the way they can impact your blood sugar, promoting inflammation and energy spikes and crashes. I picked up a bag of almond flour at Costco (get my shopping list here!) and I have been having a deliciously delightful time experimenting with different recipes. These Almond Spice Pancakes are another big hit and I’m working on a Vanilla Chocolate Chip Pancake recipe that I will be sharing soon (just need to taste test another batch or three). I love using almond flour as my base because it’s high in protein and fibre, gives baked goods a great texture, and has a really nice, subtle flavour. I was using a lot of coconut flour, but have found that for people who don’t love the flavour of coconut, almond flour can be a great alternative. 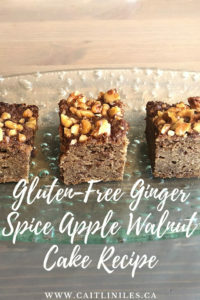 I also love packing my baked goods with spices like cinnamon, which is great for helping promote blood sugar balance, and ginger, which is a potent anti-inflammatory! I also don’t recommend peeling your apples because the rind has a lot of fibre, with some impressive health benefits. Alright, let’s get to the goods! This cake is the perfect snack any time of day! Packed with flavour, low in sugar, grain-free, and high in protein you can even have it for breakfast! Preheat oven to 350C and grease a 9x9-baking dish with either butter or coconut oil. Set aside. In a medium sized mixing bowl add together all dry ingredients, stirring to combine thoroughly. Set aside. Using eggbeaters or a mini food whip together butter and coconut palm sugar until combined. Then add in eggs and vanilla and whip until relatively smooth (the coconut palm sugar won’t dissolve the same way as white sugar, so don’t be too precious about getting it smooth). Stir in apples and grated ginger. Spread evenly into the baking dish and top with walnuts and remaining tsp. of coconut palm sugar. Place in the oven to bake for 65 minutes. Remove from oven and let cool a few minutes before transferring to a cooling rack. Well friend that’s our recipe for today! I hope you enjoy it! If you’re looking for even more motivation when it comes to your self-care,make sure you download my FREE Anti-Inflammatory Meal Plan & Shopping List right here! As always, thank you for your love and support! All the best for a fabulous year!